Unlock Tampa Bay this weekend with Kat's Top 5 things to do! Unlock Tampa Bay this weekend with Kat&apos;s Top 5 things to do! It&apos;s a BUSY weekend in Tampa Bay! Here are a few of my top 5 things to do this weekend in Tampa Bay! If you hear high-pitched shrieks tonight in Tampa don’t be alarmed, it’s just the Backstreet Boys fans who are mostly grown women with jobs and responsibilities, not your usual teeny boppers. Tonight this dreamy boy band will take over The MidFlorida Credit Union Ampitheatre with Jesse McCartney and DJ Pauly D. Super Fans and night owls, Nick’s baby brother, Aaron Carter has a post-show performance at the Seminole Hard Rock & Casino that you don’t want to miss! Tickets range $45-$135 for more information visit http://concerts.livenation.com/backstreet-boys-in-a-world-like-tampa-florida-08-23-2013/event/0D004AA105188002 . Tampa Bay Comic Con runs today (Friday) through Sunday at the Tampa Convention Center. This year there are a ton of celebrities from hit shows like Walking Dead, Game of Thrones and even little Primrose Eerdeen from The Hunger Games will make appearances and sign autographs. Check www.tampabaycomiccon.com for celebrity meet and greet times/autograph times. Tickets range from $20 for one day or $45 for all three days and kids 12 and under are free. Don’t leave your wallet at home though, autographs and photos with the stars will cost you around $30. If you’re not really into Comic Con, post up at The Sail Pavilion along Tampa’s Riverwalk, grab a beer and check out the scenery not to mention some of the most AMAZING costumes ever! Who doesn’t associate Rum with summer? Leave it to Tampa to bring you an amazing festival that combines two of my favorite things! 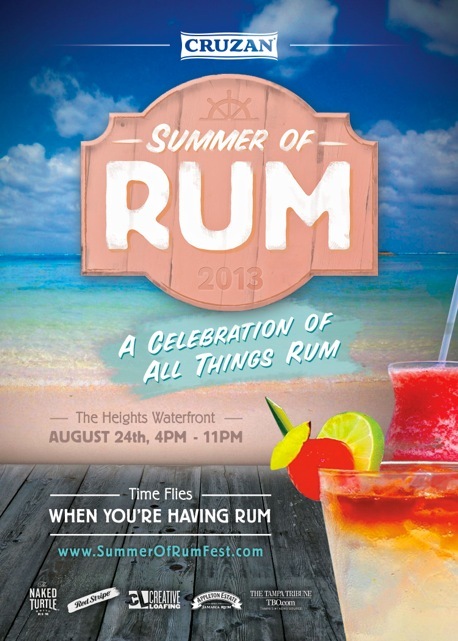 The event kicks off Saturday at the Heights Waterfront at 4 p.m. and rums , I mean runs until 11 p.m. General Admission Ticket are $20 at the door (if not sold out online already) and includes entertainment, unique rum zones, access to rum shacks and for only $5 you can purchase 12 oz. rum drinks inside. For the “VIP”ers out there…. You can purchase the “Endless Rum Cup” ticket for $60 at the door (If not sold out online already) and enjoy unlimited rum drinks at all four rum zones. We all know if you are going to be VIP in Tampa you have to have accessories to prove it, Endless Rum Cup goers will receive lime green Naked Turtle Sunnies (sunglasses) and a special Summer of Rum Hurricane glass. For more information on the event visit www.SummerOfRumFest.com and lastly, plan ahead to be responsible. Don’t drink and drive. Plenty of cabs will be on call and Zingo Tampa will also be there to get your car and you home happy and safe. Well folks, this is your LAST weekend to check out Sea Monsters Revealed at MOSI. This exhibit packs up and heads to the Georgia Aquarium after Sept. 2nd. If you were a fan of the “Bodies” exhibit at MOSI a while back, check out this immersive and interactive experience. Sea Monsters Revealed uses the revolutionary polymer preservation technique, commonly known as plastination, to bring real sea animals onto dry land for an up-close and personal look at the most mysterious creatures the deep sea has to offer. Visitors will not only see the outside, but also the inside of the most elusive aquatic life ever discovered, including a 6-foot-wide manta ray, a 15-foot-long mako shark, a giant squid, and an 18-foot-long, 3,000 pound whale shark. Tickets are around $19-$13. For more information on Sea Monsters Revealed at MOSI visit www.mosi.org . Saturday, join Tampa’s Lowry Park Zoo for the 11th annual Zoo Run Run, a 5k run that winds through the Zoo and along the Hillsborough River. Children can enter a special “Fun Run” which follows the 5K. Registration includes admission to the Zoo for the day and all early bird resgistratns are guaranteed a t-shirt. Check-in for the run starts at 6:30 a.m., Race & Walk starts at 7:30 a.m. and Run Run starts at 9:15 a.m. Cost is $35 for adults and $10 for the kids. For more information visit www.LowryParkZoo.com . Stay tuned for more ways to Unlock Tampa Bay! Hope to see you around at some of the events. Be sure to send us a tweet @VisitTampaBay we love hearing from you! AND don&apos;t forget about Dine Tampa Bay Restaurant Week this weekend! We have 93 restaurants participating, make a reservation today! Cheers to the freakin&apos; weekend y&apos;all!